I call it back-scratching, and it is a topic I have been researching for three years. While trading favours can lead to amazing levels of productive human cooperation, it can also generate a considerable amount of unproductive cooperation when the trades benefit the few at a cost to the many. 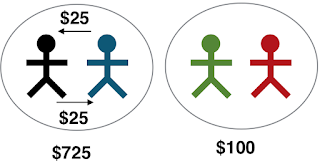 More than that, back-scratching can come with substantial efficiency losses; the costs to outsiders can far outweigh the gains to favoured insiders. The revolving door between regulators and the regulated is one clear mechanism sustaining back-scratching. Ben Bernanke is just the latest long list of powerful regulators swinging through this door. But studying back-scratching in the wild faces a major problem. Favours are almost impossible to objectively observe. Not only is there a powerful incentive to conceal favours, determining the ‘no favour’ counterfactual is almost impossible. Was the government contract given to the most efficient firm? Or was it a favour to the winner because an alternative bidder could have delivered a better outcome for the price? More often than not we just don’t know. I have a new working paper out reporting an experiment on the economics of back-scratching. Studying back-scratching in a controlled experiment, while sacrificing realism, allows a close examination of the fundamental cooperative processes at play. The ‘big new thing’ I was able to do, in light of the long history of cooperation games in social psychology and economics, was to measure costs of back-scratching against an efficient counterfactual, and test which institutional designs encourage or curtail back-scratching. 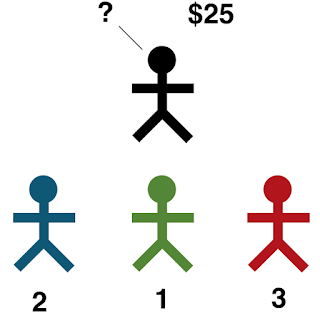 To be brief, the basic experiment has 4 players in a group (the minimal number for an in-group and out-group to form), with one player able to choose which of the others to receive a prize of $25 in a round (in experimental currency). The payer who receives the prize allocates a fresh $25 the next round to one of the other three. Obviously the best thing to do is form a back-scratching alliance with one other player and trade the $25 favour back and forth. Over 25 rounds an alliance pair would make $625, while the other two would make nothing. 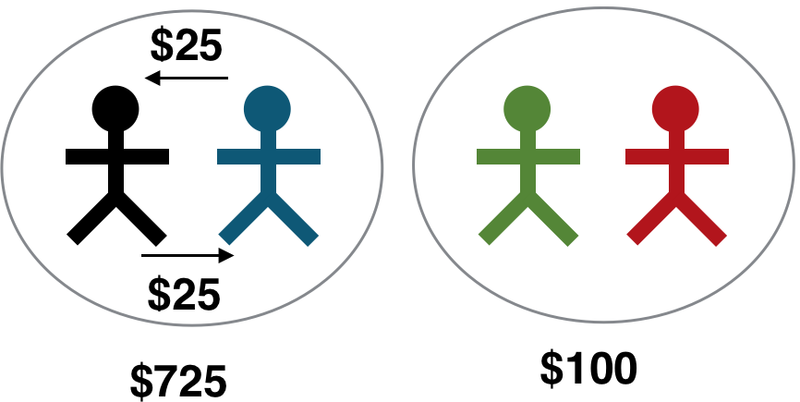 What makes back-scratching costly is that each of the potential recipients is given a randomly shuffled ‘productivity number’ each round, either 1, 2 or 3, which determines a payoff for everyone in the group. Each player gets an amount equal to the receivers productivity number in a round. Give the prize to the player who is 1, the group gets $1 each. 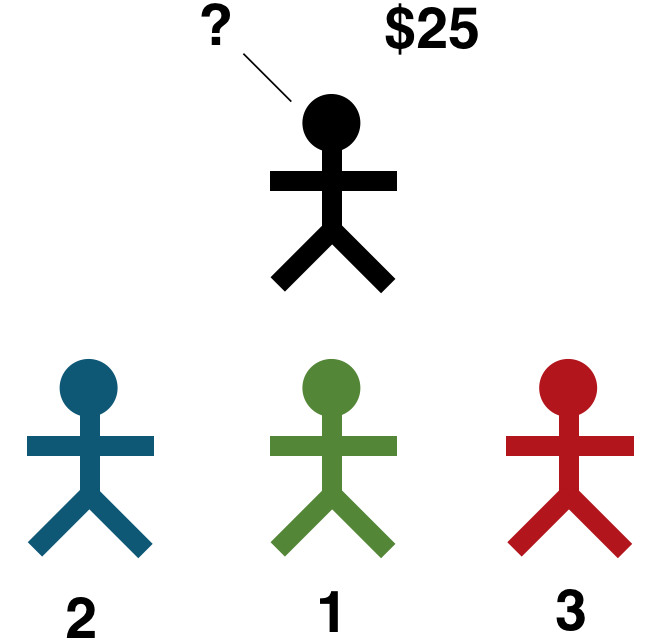 Give the prize to the player with 3, the group gets $3 each. Think of this productivity number as reflecting the efficiency firms competing for a government contract. To sustain a back-scratching alliance means not choosing the most productive player for the prize in two-thirds of the rounds. It earns the alliance $725, the outside group $100, and comes with an efficiency loss of $100 from the repeated non-productive choices. It turns out that most players repeatedly formed alliances, even though they were young honest university students who didn’t know each other. In real money terms (rather than experimental currency) alliance pairs ‘stole’ $30 from the outsiders to increase their alliance earnings by $20. Surprisingly alliance players were happy about their actions. 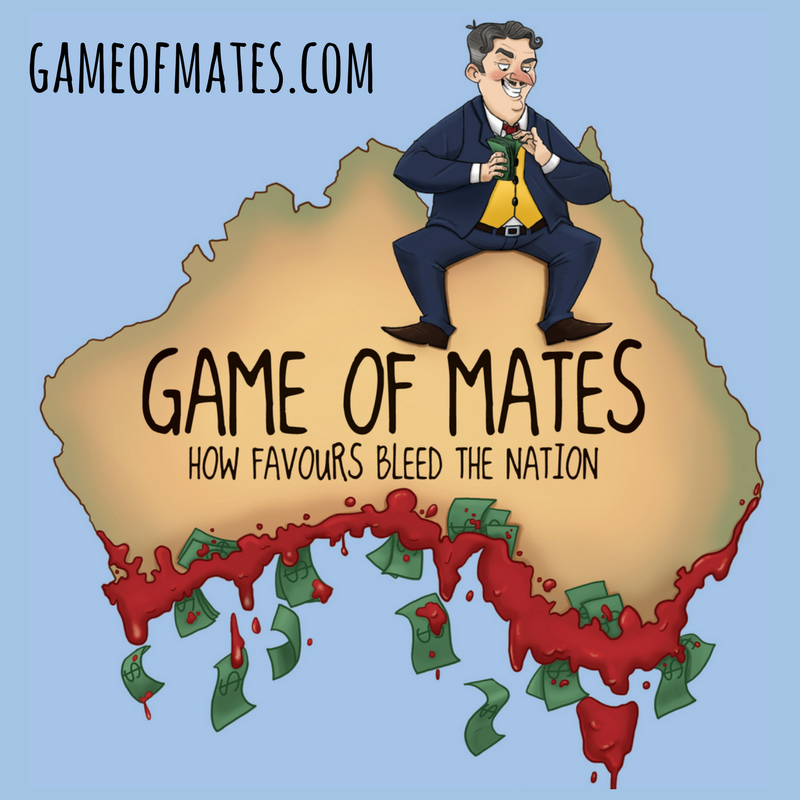 They thought they had been very cooperative by doing their mate a favour, and didn’t feel guilty about the costs they imposed on others. They also rationalised their behaviour, saying that forming an alliance is a justifiable strategy, while also concealing it by lying when explicitly asked in a later survey if they had formed an alliance. I tested two institutional changes in the experiment. 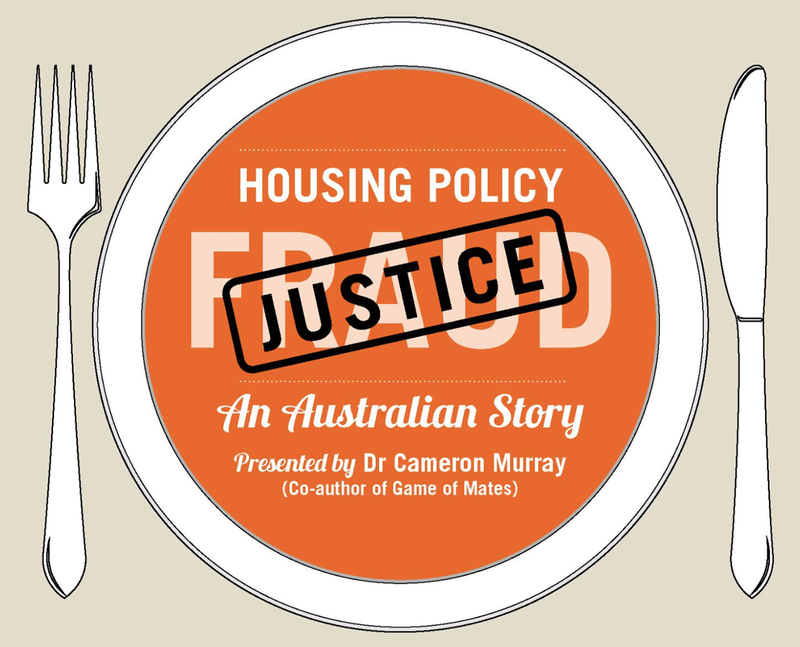 Staff rotation, a common anti-collusion policy, and a low-rent policy mimicking bureaucratic procedures to limit the size of prize able to be allocated with discretion. Neither was particularly effective at stopping back-scratching. I also manipulated the strength of relationships between players. Loyalty is strong. Rotation policies are good, unless those people being rotated in have existing loyalties. This means there is a trade-off for regulators; staff with more industry experience are also likely to come with stronger prior alliances and hence be more prone to back-scratching. In politics it means voting in a different political party brings with it the alliances of that party. Bureaucracy can work. 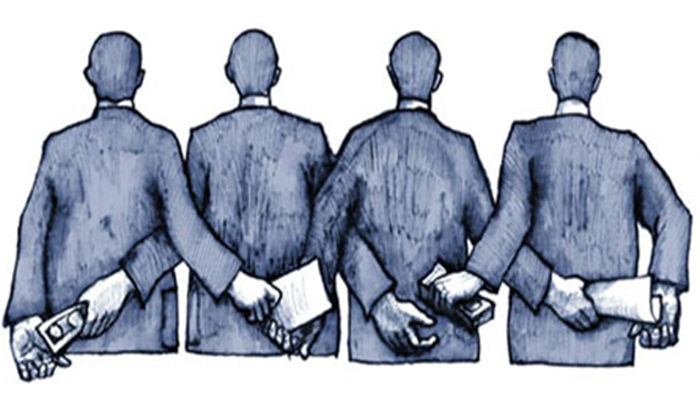 The array of procedures emerging in our large organisations could simply be the result of seeking internal fairness over favouritism. But back-scratching can still arise even with minimal amounts of discretion. Social norms are strong. In organisations or groups where some people are observed ‘doing the right thing for the group’, this quickly becomes the norm. Whereas where favouritism is observed, the group descends into counterproductive back-scratching. Be loyal, but not too loyal. If your alliance partner fails to come through with favours when expected it pays to look for someone else whose back needs scratching. None of this is really rocket science. If this sounds obvious to you then you’ve probably learnt a lot about human behaviour through life experience. It also means the experiment is capturing some elements of real phenomena. After spending three years researching this topic, of which this experiment is a small part, I have come to the conclusion that group formation through favouritism is probably the primary determinant of political outcomes. Countries themselves can even be seen as a loose alliance of insiders looking to do what’s best for themselves even when it comes at a cost to other countries. This. Fundamentally. 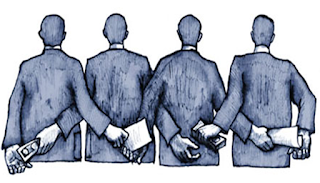 Is why corrupt back-scratching is so hard to eradicate, and why it will continue to be the main game in politics. Excellent work here. Provokes a lot of thought. Having been put off completely by Kahnemann's silly System 1 System 2, I find this refreshing. Back scratching within bureaucracy which involves "protective" functions as well as "productive" functions is also described by this, I would think. Look forward to reading the paper.